Wheat Stocks Rallying to New Highs: Invest in the Dip Now for Big Gains! This year is set to close with 273 million tons of wheat produced. That’s an all-time high. “Record supplies” is all that needs to be said to turn off most resource speculators. A well-supplied market is the enemy of higher prices. Investors and speculators are passing over wheat, looking for better opportunities. But the story here is not as straightforward as it seems. Even with historic supplies, markets are tightening. China (purple in the chart above) controls about half of the world’s wheat inventories. The nation of 1.4 billion people committed to stocking up on wheat in recent years. The grain is seeing growing demand from a increasingly westernized populace. Stocking up gives China food security. Shanghai indicated that it will continue to store wheat. That means nearly half of the world’s supply is off-limits to global trade. Discounting Chinese stockpiles, the world hasn’t seen a wheat market this tight since 2007. At the time, wheat was trading around $5 per bushel. That’s not far from today’s price of $5.08 per bushel. The following year, wheat surged over 100% higher to $11.60 per bushel as the fear of supply shortages rippled through the market. We are seeing a similar setup today. Poor growing conditions in Argentina, Australia and Eastern Europe saw flagging production this year. That’s helping to keep supplies tight. 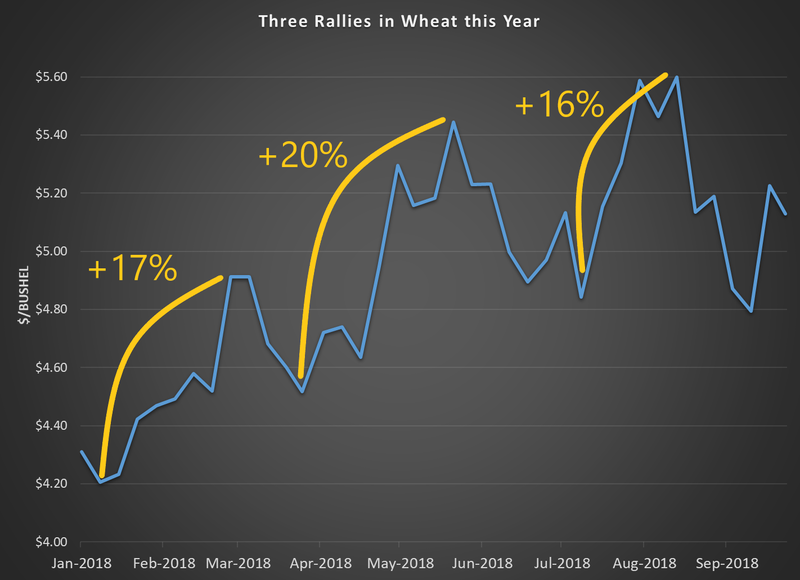 Wheat has tested three rallies this year. Each time, it reached a new high. The recent pullback in prices is the perfect time to get in before the next rally. Due to favorable growing conditions this year, American farmers are in an especially great position to profit from higher wheat prices. I see the price of wheat running up 17% to $6 per bushel in the next few weeks. The next rally later this year could carry prices even higher. Consider buying the Teucrium Wheat ETF (NYSE: WEAT) to capture the trends in wheat. The exchange-traded fund uses futures contracts to capture the change in wheat prices.